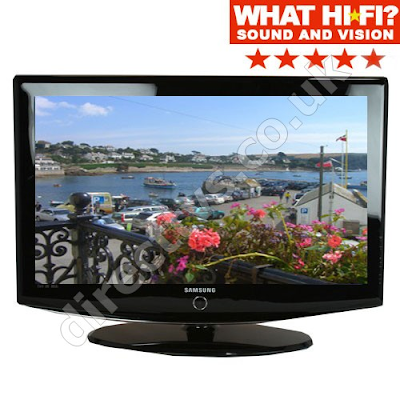 I finally decided to get a new family TV and as LCD technology came such a long way in the past couple of years, I got the Samsung LE-32R87BDX (750 Euro from DirectTvs.co.uk) and I must say it was quite a pleasant surprise. 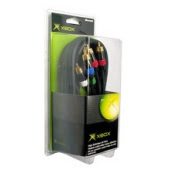 Although the image is quite good with the standard Xbox cables, I would get the Microsoft Xbox High Definition AV Pack, but with the push of Xbox 360 lately, it's almost imposible to find any games or cables for old Xbox systems. If anyone knows where I could order it in Europe, I would really appreciate it. Thanks. I finally got a brand new Monster GameLink 400X cable on eBay for a fair price (although the shipping from US was more than the cable itself :-) and it looks the image has improved with the component compared to the the standard Euroscart connection - the texts in XBMC are cleaner and colors are brighter - and this is in standard 720x576 PAL 16:9. Apparently, in order to be able to change to change to HDTV resolutions I have to switch the XBox from PAL mode to NTSC using a tool called Enigmah PAL/NTSC Selector - looking forward to do that this weekend. So what is better choise? MS HD AV vs. Monster Cable GameLink 400x/GameLink 200 SCART. 400x using RCA but SCART should be better? Isn't it? And why you wanted change your xbox from PAL to NTSC? P.S. I am using XBMC (T3CH XBMC 2008-10-06 SVN rev15805-BETA2)-Atlantis Beta2 primary for watching movies, music, photos. SHould i change it to NTSC too? You can follow this thread on Xbmc.org, http://xbmc.org/forum/showthread.php?t=20699&highlight=monster&page=17 and lots of other othes, but on short, both MS High Definition AV Pack and Monster Gamelink 400x are component cables to enable using HighDEfinition on your TV (480p, 720p, 1080i). I believe Monster 200 is nothing more than the Scart cable that came with the box with the adition of digital audio output. 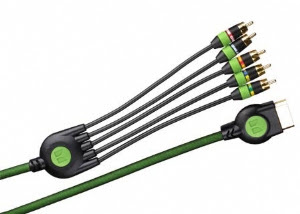 The first ones are obviously better, it's not the RCA that matters (btw, RCA refers to the connector), it's the component vs composite. If you can find the Microsoft HD AV Pack go for it, I believe it does the same job as Monster 400x, it's just that Microsoft stopped manufacturing those a while ago so they're very hard to find, while you can find Monster cable is not cheap at all. Read this KB from Microsoft (http://support.microsoft.com/kb/817146)as there are two versions of the product, an older with which you have to provide your won cables and the newer one, with cables included. You have to use the Enigmah tool to switch the video chip to NTSC mode, otherwise you won't get the HD options (480p, 720p, 1080i) in the MS Dashboard Settings > Video, even if you connect the component cables. All I can say for now is read that thread on Xbmc.org and search for the tool on gamecopyworld dot com. Once you switch you can enable the HD options and use those in XBMC - it makes a BIG difference specially in the UI interface, photos and even videos. Read the threads on Xbmc.org and although people there would be happy to answer your questions, feel free to come back if you want totalk about it some more.